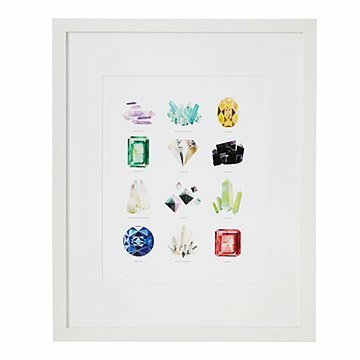 This print from an original watercolor by Katie Gastley depicts a vibrant collection of 12 gems and minerals. This print from an original watercolor by Katie Gastley depicts a vibrant collection of 12 gems and minerals, from sunny citrine to inky obsidian. The interplay of richly hued washes and crisp, hard edges give each geological wonder distinctive character. Designed in Vero Beach, Florida; printed in Portland, Oregon. Having studied painting and graphic design at Pratt Institute in Brooklyn, Katie Gastley segued into the stationery world as a means to create a fun, shareable product that would showcase her hand-painted designs. She launched her paper goods company there in 2010, selling at the local craft festivals. Her shop and studio relocated to sunny Vero Beach, Florida, where they ship and operate from today. When not painting (in the middle of the night,) Katie can be found antique scavenging or en route to or from New York. Arrives matted and framed, or only matted.